01:40:00 Makes 6 servings, 3/4 cup (175 mL) each. Makes 6 servings, 3/4 cup (175 mL) each. 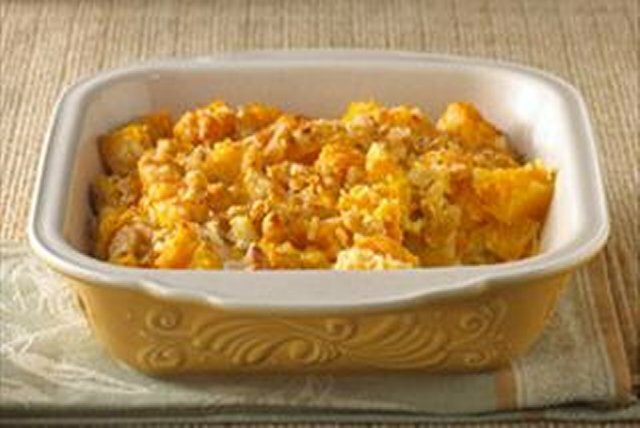 Nothing says fall like squash, and here’s an easy baked recipe made extra special with Cheddar cheese and onions. It’s wonderful alongside roasts and chops. Cook squash in boiling water in covered saucepan 15 min. or until tender. Rinse under cold water; drain. Mix squash and remaining ingredients; spoon into 8-inch square baking dish. Bake 1 hour or until heated through. Prepare using Cracker Barrel Shredded Tex Mex Cheese. Serving Size Makes 6 servings, 3/4 cup (175 mL) each.